Most young children are enrolled in early education and child care programs, and these programs can take steps to prevent and control influenza. Seasonal influenza outbreaks are expected annually. Influenza can be severe, resulting in hospitalization or death of some children. Immunization against influenza is the best strategy to reduce infection and spread, yet immunization is not 100% effective. Out of some immunized children, few may even still get sick and spread infection. Influenza generally is an acute, self-limited, and uncomplicated disease among healthy children. It is caused by influenza A or B virus and sometimes by type C virus with yearly outbreaks. This is an acute respiratory illness which occurs more frequently during the seasonal changes in temperate climates. There are generally two drugs recommended for antiviral treatment of influenza in duration of 5 days such as oseltamivir or zanamivir. Patients who remain severely ill after 5 days of treatment are considered for longer treatment courses. Uncomplicated influenza is treated with intravenous peramivir for the duration of one day. The most common symptoms of influenza include high fever, runny nose, headache, muscle pains, coughing, sneezing, sore throat, and feeling tired. There are policies for the prevention and control of influenza that is updated every year by both the Centers for Disease Control and Prevention (CDC) and the American Academy of Pediatrics (AAP). According to the recent policies, depending on the child’s age at the time of the first administered dose and his or her vaccine history, the number of seasonal influenza vaccine doses will be administered in the 2017-18 influenza season. Pediatric Influenza Treatment Market is anticipated to record a significant CAGR of over 3.2% the forecast period. The market is also anticipated to value at USD 929 Million by the year 2027. Many multi-national companies are concentrating towards new product advances in pediatric influenza treatment market. For instance, Roche’s oseltamivir (Tamiflu), with an oral capsule formulation overshadowed GSK’s zanamivir (RELENZA) revenue of USD 13 million just after entering the market in the past. At present the global pediatric influenza treatment market is observing vibrant growth owing to increasing demand of antiviral drugs due to endemic influenza outbreaks in various parts of the world. Advance in healthcare industry in the past few years and growing research and developmental activities in pharmaceutical industry is projected to drive pediatric influenza treatment market. 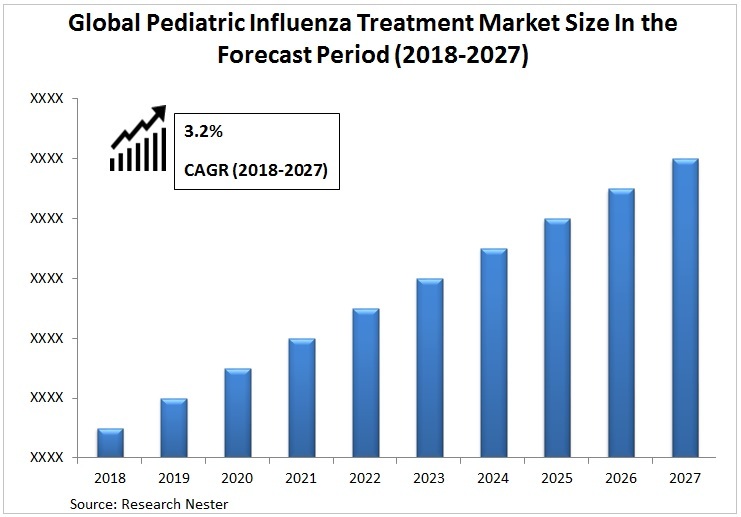 Additionally, decreasing immunity levels in the present pediatric generation on account of change in living style and unhealthy eating patterns is anticipated to propel the global pediatric influenza treatment market over the forecast period. On the basis of regional platform, global Pediatric Influenza Treatment market is segmented into five major regions including North America, Europe, Asia Pacific, Latin America and Middle East & Africa region. On account of well-developed healthcare industry and higher cost of antiviral drugs, North America is panned to observe substantial pediatric influenza treatment market growth due over the forecast period. Moreover, frequent publication of results of upcoming treatments due to decent awareness regarding healthcare is anticipated to increase the pediatric influenza treatment market. Europe is predicted to follow North America in terms of consumption due to expanding pediatric influenza treatment requirements in developing and temperature changing regions of Europe. 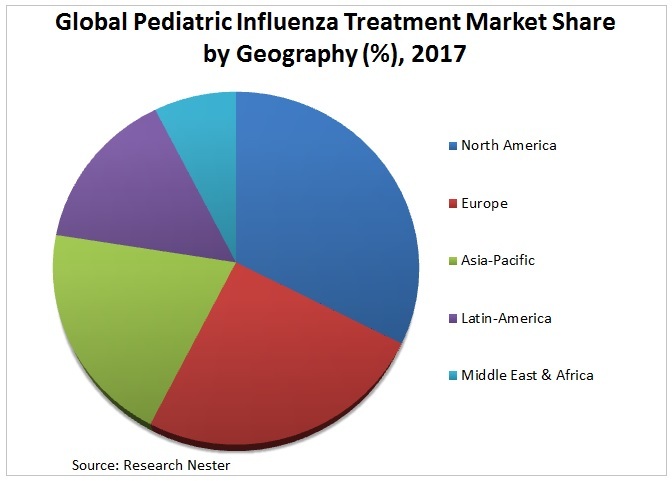 The rising demand for pediatric influenza treatment in the temperate regions of the world to can diminish the span and seriousness of the disease is expected to expand the market for pediatric influenza treatment drugs over the forecast period. Increased indications of influenza in the age groups ranging from 1-9 years have resulted in the contribution of major chunks of value to the pediatric influenza market. Early treatment to stabilize the patient and prevent deaths is anticipated to increase the pediatric influenza treatment market over the forecast period across the globe. Reducing immunity levels in the pediatric population due to changing living standards and irregular diets is predicted to expand the demand further for pediatric influenza treatment. Irregularly changing weather conditions across the globe due to global warming is further anticipated to increase the outbreaks of pediatric influenza resulting in propelled demand for pediatric influenza treatment in developing as well as developed countries of the world. However, usage of low cost non-prescribed drugs, limited number of options to treat influenza in the developing economies with cost constraints attached to it is expected to behave as the major restraints in the growth of the pediatric influenza treatment market over the forecast period.